China has a vast territory and a large population. Customs vary in different places because of different histories, cultures and ecological environments. 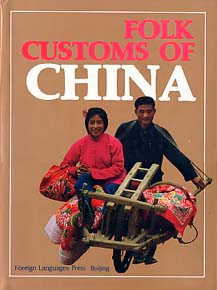 Folk Customs of China is an illustrated album that introduces the customs of the Han nationality. It describes the life of the Han nationality, including cuisine, costumes, architecture and transportation, etiquette and customs, traditional dances, theater and folk art. The album includes more than 300 photographs which were collected by photographers and writers who visited many provinces and more than 100 counties and towns. The text tells about the origins and development of some customs. Zhong Jingwen, a well-known Chinese folklorist, prefaces the album.